KNRUHS PG Medical Admissions Final Merit List: KNRUHS PG Medical Admissions Final Merit List after Certificates Verification of Weightage of Marks for service candidates. KNRUHS has notified that the web based counseling will be conducted for admissions into Post Graduate Medical Degree / Diploma Courses for competent authority quota in colleges affiliated to KNR UHS and PG Medical Courses for the academic year 2019-2020. 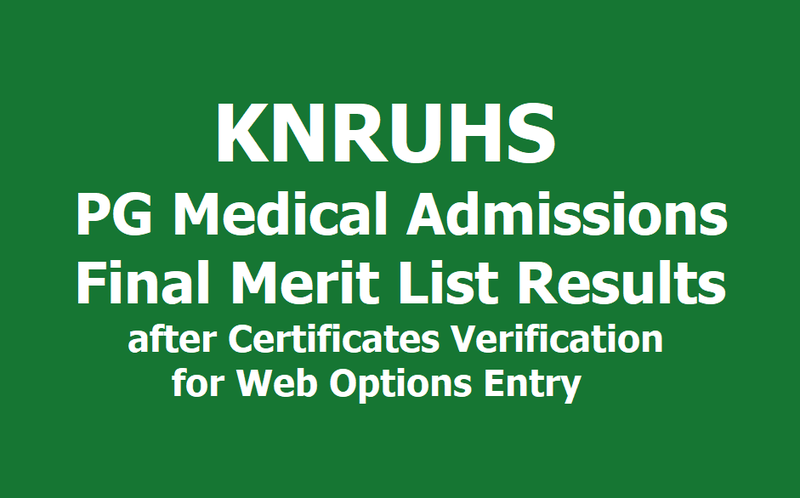 Candidates who have applied online in response to KNRUHS notification dated 22-03-2019 and whose names figure in the Provisional Merit list of PG Medical admissions was displayed on 29-03-2019 in the Website of KNR UHS. They were attended for FIRST AND FINAL verification of their original certificates as per the schedule. Candidates were attended in person along with print-out of their application form duly signed and two sets of self attested xerox copies. After verification of original certificates, the final merit Position of the candidates are determined and notified so that the candidates in the final Merit list can exercise web options for Post-Graduate Medical Degree / Diploma Courses as the case may be as per the schedule. Candidates are hereby informed to submit valid Permanent Medical Registration Certificate at the time of reporting to the Principal of allotted college. Candidates whose Permanent Medical Registration Certificates issued prior to May-2014 shall compulsory renew the certificate at their respective State Medical Council and submit the same. Admissions of candidates without renewed Permanent Registration Certificate ( Issued prior to May-2014 ) will not be permitted. Candidates can get their certificates renewed under tatkal category if necessary.